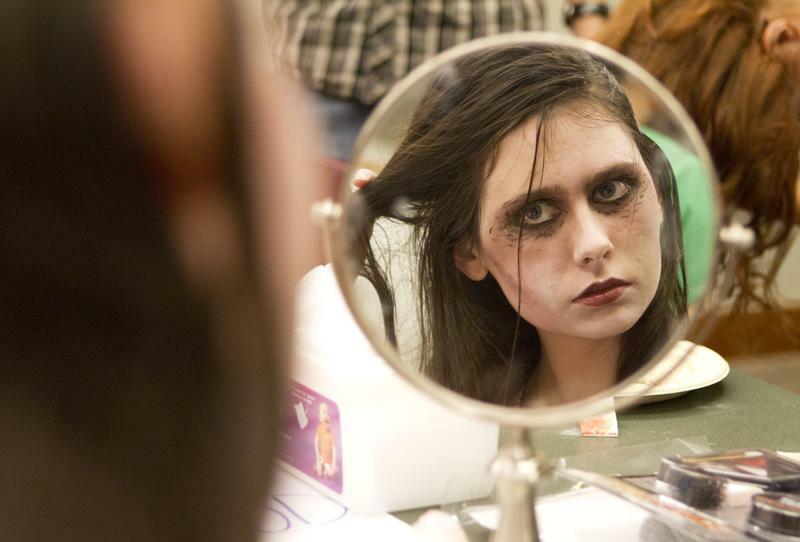 Weinberg freshman Marie Peeples puts the finishing touches on her zombie look for Jumpstart's "Zombie Walk" Monday night at the Evanston Public Library. The Evanston Public Library welcomed teenagers for the library’s first “Zombie Walk” Monday evening to celebrate Halloween. EPL director Karen Danczak Lyons said the event is one of several ways the library is trying to open its doors to teens ages 12 to 18. The event started at 7 p.m. with scary stories told by librarian Rick Kinnebrew. The zombies, kids and adults draped with bloody rags, then headed out to the streets to start their walk. The march led the participants in a circle around Fountain Square, starting from the library entrance at Church Street and Chicago Avenue. Many volunteers dressed as zombies stopped at businesses along the way, peering through glass windows to scare the people inside. About 50 people, including 30 volunteers from Northwestern and 20 Evanston residents, participated in the walk. Although she was not present for the event, Lyons said she is sure that the zombie walk will help present a new image of the library to students in Evanston. “We are looking at new ways to bring new members of the community to the library,” Lyons said. She added that this was also an opportunity to continue the relationship the library holds with NU students. EPL worked with Jumpstart, an NU mentoring program, to coordinate the event. Kinnebrew, the children’s outreach librarian, said NU students helped out as makeup artists for local teenagers dressed up as zombies. Lyons said events such as zombie walks are an opportunity for students to view the library as an essential part of their personal and professional life. “We want all the teens to realize that the library is a safe and welcoming space,” she said. Kinnebrew said he shares that objective, adding that teenagers comprise the group most difficult to connect with nowadays. Because the theme of zombies is so popular, he said, it seemed like a fun way to reach out to teenagers. He said although this is Evanston’s first zombie walk, there are other cities that host the event each year, which is something he aims for. “My hope is that it goes really well and that it’s fun for all the participants, and then we can do it next year and maybe make it an annual event on a larger scale,” he said. Kinnebrew added that events like the zombie walk give teenagers “an opportunity for self-expression.” He said he believes that it is the library’s role to promote teen identities, and he hopes EPL will become an iconic building within the community. Lyons, who came to Evanston after working as Chicago Public Library commissioner, said a library should be one of the most important buildings in a city. Events similar to the zombie walk strive to make the library a part of each citizen’s life, she said. “I want all of Evanston to view the Evanston Public Library as the important third space in their life after home and work or school,” she said. Chu said the library is not only a place to check out books or look for information, but also a place where children can learn how to be themselves. She said that events like the zombie walk teach children how to interact with other people.